The Best Selling Candy Fundraiser! Each Carrier Contains: 12 Hershey Take5, 10 Reeses Peanut Butter Cups, 10 Kit Kat, 8 Hershey's Chocolate Milk, 6 Hershey's Milk Chocolate with Almonds and 6 Caramello candy bars. 4 carriers per case. Everyone will love the Hershey Max Variety Pack - it contains 6 different candy bars that are as adored as much as they are known. Expect your supporters to come clamoring for more, thanks to the great tastes and cheap prices. How Does The $1.50 Hershey's Max Assortment Fundraiser Work? 6. Your participants will sell each of these Hershey Max candy bars for $1.50 each, and collect their money on the spot. 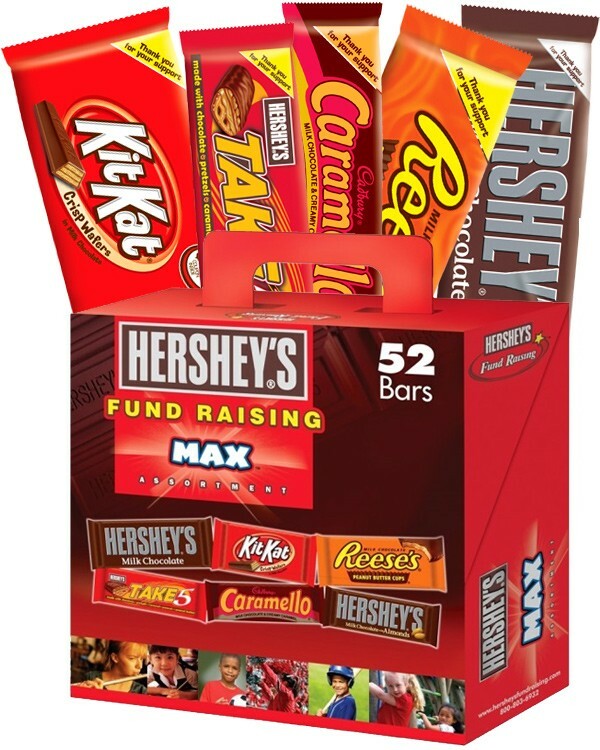 Our delivery was quick and easy and selling a well known brand like Hershey made our fundraiser a huge success. We sold our 4 cases in no time and will be placing another order soon!